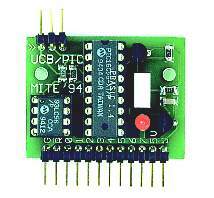 UCB/PIC-B (Universal Control Board based on PIC CPU) has been produced since 1994. Even though it is a very very old design, it is still being used for its brilliantly simple use. Especially thanks to the built-in programming language interpreter (PBASIC), which allows you to create a control program on any PC and load it on “click” into a microcomputer module. Each of the eight pins of microcomputer can be configured as a logical input / output port, serial asynchronous input / output line, synchronous input / output line, PWM, can generate frequency, measure pulse length etc. More about programming in manual. The interface adapter enables the UCB/PIC-B microcomputer module to be connected to the PC via a serial line, the correct orientation is indicated >> on both PCBs, the connector is DB9F. If there is no serial port on your PC, it is usually created as a virtual port on the USB port using an adapter. This is either a standalone or built-in USB cable. You need to be sure that the software driver will be supported by the operating system, we recommend hardware based on the FTDI chip. The adapter (FTDI) creates a virtual serial port, ending with the DB9M. 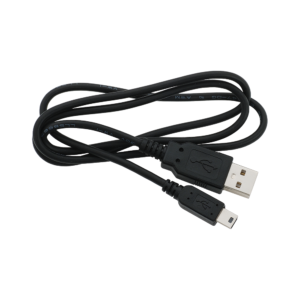 Use USB cable USB A – mini USB B. The virtual port adapter is built-in directly into the USB cable ending with the DB9M connector. An alternative is the compact USB-DB9M adapter.